Smoking has been conclusively identified and documented as detrimental to pregnant women. It comes as no surprise that women seeking to achieve pregnancy through in-vitro fertilization are also similarly affected. Since smoking has already been linked to an increased incidence of premature ovarian failure as well as early menopause, ovarian function in IVF cycles performed on smoking women has fallen under heavy scrutiny. According to several studies, women undergoing IVF treatment are less successful if they smoke during the course of treatment. These studies have demonstrated that the smoking adversely affects a woman’s reproductive system, causing the organs to age prematurely. A Dutch infertility study in 2005 found that the overall effect of smoking two or more cigarettes per day for one year reduced a woman’s chance of carrying a IVF pregnancy to term by 28%. This reduced success rate is illustrative of the difference between women of 20 and 30 years of age. For women who smoke, they might as well be ten years older than they really are. In the study, women with unexplained infertility who were smokers were found to have a 13.4% success rate in carrying their pregnancies to term, as compared to 20.7% for non-smokers. Moreover, the miscarriage rate in the study was found to be 21.4% for smokers, versus 16.4% for their non-smoking cohorts. 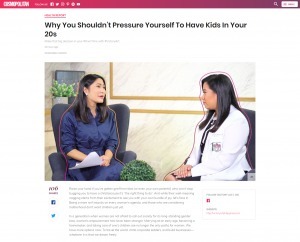 The local setting has seen many benefits from advances in medical science, as increased IVF success among Filipinos proves to be encouraging. However, with smoking such a prevalent health issue among couples of reproductive age, it is important that they are aware of these inconvenient truths. Cadmium, polycyclic aromatic hydrocarbons, nicotine and its metabolites interact with germ cells themselves, adversely affecting their survival. Cigarette smoke has also been shown to have an anti-estrogenic effect, and the constituents of tobacco may affect the ovaries’ ability to synthesize hormones necessary to maintain pregnancy and carry a fetus to term. In-vitro studies have investigated the effects of tobacco on the cumulus-oocyte complex and oocyte maturation, showing that nicotine affects the cell’s ability to divide normally. Tobacco smoke also adversely affects the early development of embryos, leading to embryo death even before the blastocyst stage. Smokers also produce oocytes with thickened zona pellucida. The thickness of this membrane is one of the major factors affecting embryonic hatching ability, implantation, and overall pregnancy success rates. Smoking affects all aspects of health, and cases of infertility in the Philippines are no exception. It is of utmost importance that women and couples seeking IVF treatment are aware of how they can improve their chances of becoming pregnant by making the right decisions.